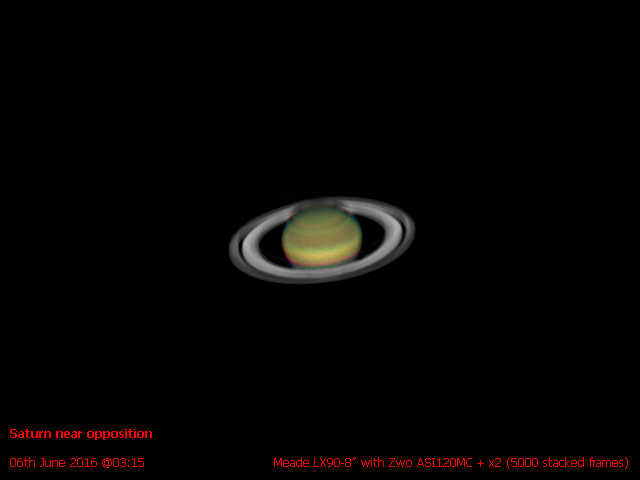 Finally got round to processing my images of Saturn at near opposition, well just a couple of days off full opposition (06th June). Seeing was the best I have had all year considering Saturn's low position in the sky, plus living in Leeds. Took a larger number of frames for my AVI's this time and as seeing was much better, stacked 5000 frames from 10000. Meade LX90-8" with Zwo ASI120MC and x2 barlows.